Some of you know him from our Ecuador Climbing School, Topo’s home turf. At 28-years-old, you could consider Topo a young guide, yet his climbing career has spanned more than half his life and he is already a certified IFMGA mountain guide. Topo is the youngest human to climb Everest without oxygen and without Sherpa support (age 23 via the Normal route, Northside). Topo is an all-around climber from big walls to 8,000m peaks and he has put up first ascents all over the world. Clearly, he is a crusher in the mountains, but he is also the kind of guy who has earned himself a reputation for singing and dancing during tough summit pushes. Saying we’re “psyched” to have him on our team would be the understatement of the year. Now, Onwards with the interview! Q: Hey Topo, what’s your update on Cho Oyu Base Camp? Give us a rundown of the whole plan. Topo: The Sherpas who live Phortse left their homes a couple of weeks ago, on the 23rd of August, and traveled to Kathmandu, where they gathered supplies and started packing for the expedition. After Kathmandu, they traveled by road with many hundreds of pounds of supplies and got to base camp on the 27th. The Sherpa already have our base camp kitchen, dining area and lounging area built. They are preparing the latrines, showers and everything else and they think they will be fully ready this week. 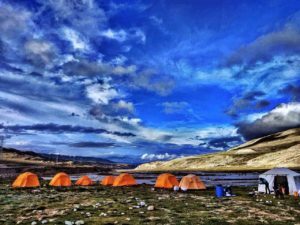 Then, some of the Sherpa will leave for Advanced Base Camp, which sits on the moraine, so it’s exact location changes every year. They will choose a new spot for the kitchen and all the other outbuildings for the team. They should be ready with ABC at some point next week. Q: What’s your experience in the Himalaya? Topo: I’ve been going to the Himalaya for 6 years and in 2013 I summited Everest without oxygen. I’ve climbed Cho Oyu one time, so I still have a 100% success rate! 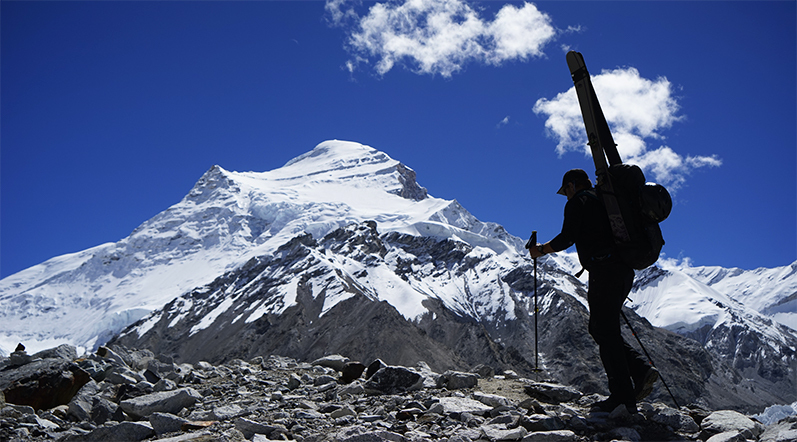 Q: What’s special about climbing Cho Oyu? What makes it a unique climb for you? Topo: Climbing in Tibet has a very special historical significance for me. It’s position geographically is very important. Long before people started climbing the mountain for sport, Cho Oyu was a gateway for Sherpas to travel from Tibet to Nepal. The foothills were used as a trade route for herders and Sherpa. I like to think of all of the explorers that came before me. Plus the views of the Himalaya are amazing, it’s beautiful. Q: So what’s your favorite view in the Himalaya? Topo: Of course, the summit of Everest is the best. Q: Who are you excited to hang out with on Cho Oyu? Topo: It is very special for me to work with Jaimie Avila. He has been guiding for the same amount of years that I have been alive. When I was young, he was one of my guiding mentors and I feel really fortunate to work with him now. In fact, he is the one who introduced me to Adrian and if it wasn’t for him I wouldn’t have been introduced to Alpenglow Expeditions. Also, I am looking forward to seeing all the Sherpa. Some of them are my same age and we started working together 6 years ago. When we work together now after so many years, we see how I have grown as a guide and how they have grown as high altitude workers. The connections made with the team are very important, we are united by the passion we share for climbing mountains. It is special to know each other for years and see how everyone is climbing now and improving. At the end of the day, we are all friends climbing a mountain together. Q: How does Cho compare with other 8,000m peaks? Topo: People say that it’s an easy 8,000m peak and, it is one of the most accessible peaks, BUT that doesn’t mean that it’s easy at all. Cho has the same risks as any other 8,000m peak has. Sure, the technical aspect of the mountain is not the same as the “hardest” 8,000m peak but Cho still involves some steep climbing. You need to be just as conscious about weather and avalanche conditions as any other high altitude peak. As one of the fourteen 8,000m peaks in the world, Cho Oyu should be respected as a very serious climb. Q: What do you do to train for big mountain expeditions? Topo: Just climbing a lot! I really like doing vertical kilometers. If I can do 1,000m in less than an hour, that’s the best training ever. I’m about to go for a quick preview run up Alpenglow’s new Tahoe Via Ferrata with Adrian Ballinger before I have to leave for the airport. Q: Tell us about Rapid Ascent on Cho Oyu. Topo: I really love it. 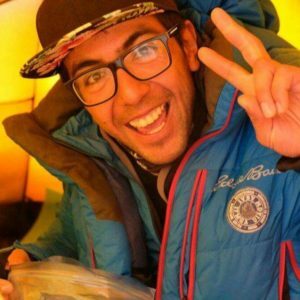 I follow a lot of climbers and guides from other companies on social media. Classic Topo. Would you climb a mountain with this guy? Q: What’s the best thing to eat in Tibet? What’s the most important thing you packed for the trip? Topo: The best thing to eat in Tibet is hands down scrambled eggs with tomatoes. And the best thing that I packed is my AeroPress. Q: What’s next after Cho for you? Topo: I have two 7,000 m peaks in Nepal that I want to climb in October but I have to keep it a secret, I don’t want to jinx it! For more information on our Cho Oyu, or any of our other international expeditions check the expedition finder on our website. For any questions call our office at 877-873-5376 or send us an email info@alpenglowexpeditions.com. We hope to climb with you soon!